“Small things happened in 2013 that felt big, and today big things are happening that feel small”. 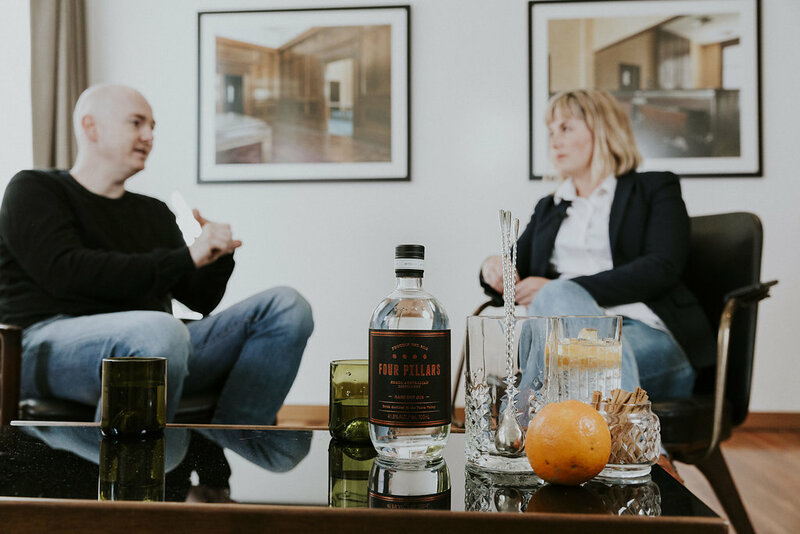 Matt Jones is Four Pillar Gin’s co-founder. He builds brands for a living and boy has he built one in the gin market. Four Pillars Gin is Australia’s fastest growing Gin brand. After just 5 years in the market, they are the number two selling gin brand after Hendrick’s. We’ve spoken to Mr Jones about his secrets to success in this three-part strategy series. You can look forward to how a delay paved the way for a powerful brand, how to scale intimacy and why marketing is a dangerous term. If you are a business leader in charge of building your company, brand or customer experience – this is for you. How starting with ‘why’ gives you direction and a point of difference. Why principles underpinning your purpose will guide your brand, portfolio and even community strategy. How you can use your brand strategy to develop your new product releases. Four Pillars Gin is Australia’s fastest growing Gin brand. We asked co-founder Matt Jones to share the brand’s secrets to success. Photography by Kat Stanley Photography. After laborious research (a road trip in America sampling craft gin), the Four Pillars founders decided that gin was definitively happening. The only challenge was, they had circled in on the prestigious Carl still – and this had a 12-month waiting list to be delivered from Germany. All of a sudden, entrepreneur and brand strategist Matt Jones was faced with the luxury of time. And what he did with that time, is what has separates Four Pillars from almost any other gin brand in the marketplace. “I had the time to think about why. Why are we doing this? If we had a still from day one, I’m sure we would have started making some good gin, develop beautiful packaging and away we would have gone. But we wouldn’t have slowed down to think about why”. The power of starting with why (purpose) instead of what (the still), is the difference between any old gin and a gin brand commanding margin and attention (the ultimate utopia). Matt elaborates: “The key to purpose is it has to be both directional and motivating. It needs to provide direction for the business and be motivating for the customer. We needed to clarify why we were creating this gin and why the customers could be excited about it”. They are seeking to elevate the craft of distilling. Their thesis is that Australia tastes great and so should the gin we drink. Cocktails: People want to drink less and drink better. Four Pillars aim to celebrate the craft of a great cocktail. Modern Australia: Share a modern Australia with the world, away from beaches and Kangaroos, to the backstreets of Flinders Lane and a visit to Aesop. Community: As a community brand, Four Pillars Gin are using local supplies in their gin making and upcycle their used botanicals into locally made produce. Matt speaks about the power of starting with why (purpose) instead of what (the still). Having principles tying back to your purpose can help you launch new products which further strengthens your brand. In Matt’s case they started upcycling the output from the distilling process by giving this away to local marmalade and cheese makers. “Gin infused cheese and marmalade was the right brand extension for us, because it elevates the craft of distilling, gives a flavour of modern Australia and it gives back to our community”. A clever way of closing the loop from breakfast to dinner. Good branding. Directional for the business. Motivating for the customer. “We don’t start everyday with existential questions such as ‘Why are we here – that can become quite tiring’”. Laughter. “We simply remind ourselves we are a business based in craft. This helps us allocate every marginal minute and dollar toward this singular focus”. Branding and purpose can become a little navel gazing. The risk is you start drinking the cool-aid and forget that people are falling asleep listening to your musings around your ‘why’. Our challenge has definitively been ‘how do we keep Four Pillars interesting and engaging, in a market where people have short attention spans and are constantly looking for the next thing. The brand has responded with a ferocious product portfolio expansion. They launch a new gin every 6 months and have now had phenomenal success the world over with their Shiraz gin, Christmas gin and their high alcohol level bartender series. Next week – how Four Pillar Gin’s founding team each bring their own unique skillset setting them up for success. Watch the video below for a snippet of Matt’s chat to Cat. Filmed by Tony Whittaker, Carnivore Films.